Game description: Enter a fantasy world where humans are on the brink of extinction. In this Final Fantasy RPG, you must stop a powerful force called "Sin" that destroys cities and lives. Along your journey, you will meet Tidus--a star blitzball player--and Yuna--a young woman who is skilled in summoning and controlling aeons - powerful spirits of yore. Final Fantasy X was the first Final Fantasy game to feature voiceovers with advanced facial expressions. Travel to uncharted seas and treacherous lands in a quest to save mankind. 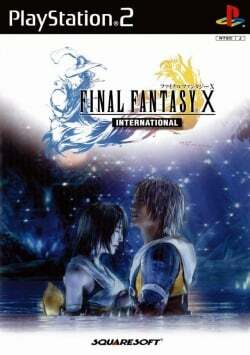 The International version of Final Fantasy X features content not available in the original NTSC releases, including battles with "Dark" versions of the game's aeons and an airship fight with the superboss "Penance". The Japanese release of Final Fantasy X International also includes "Eternal Calm", a 14-minute video clip bridging the story of Final Fantasy X with that of its sequel, Final Fantasy X-2. Never dipped below 120FPS, widescreen patches enabled, MTVU enabled. Used D3D11 @ 8x Native (4096x3584), Anisotropic Filtering @ 16x. Description: In certain battles (the Geosgaeno battle in the NTSC-U version, for example), all characters will be facing away from each other. Workaround: Set EE Clamping Mode to "Full" (According to PCSX2, setting VU Clamping Mode to 'Extra + Preserve Sign' would help this work better) or set EE Round Mode to "Negative". This page was last edited on 25 November 2016, at 17:31.